Halloween was full of little tricks and treats this year. 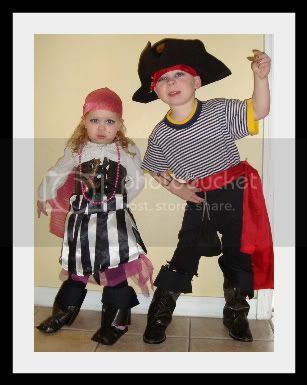 Aidyn talked for weeks about how he was going to be a "real pirate", and Ely kept repeating she was a princess until the day I tried to get her into a frilly pink number and she revealed the second part of her plan..."NO! 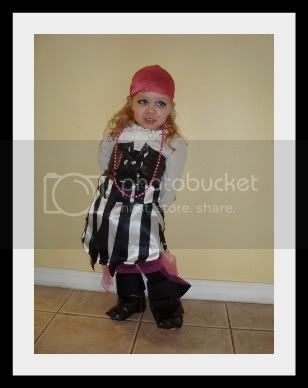 A pirate pricess!". 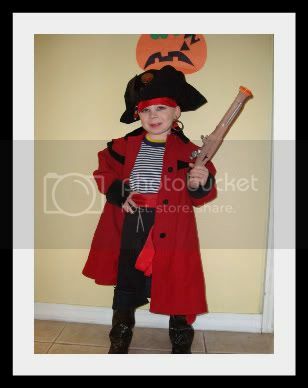 So both kids went as scurvy little swashbucklers, Aidyn decided he was the nefarious Captain Skunkbeard (trust me, that got some chuckles), and Ely simply spent the day screwing up her little face and grunting "argh!" at passersby. We spent the entire day visiting people and searching for booty, er, candy. Evan's coworkers loved the little parade we made through the offices and snapped one picture after another. Then it was off to grandpa's office, then home for a quick nap, then on to a few more relatives' houses and finally, our friends Steve and Brenda's house. That was where the dinner eating/real trick or treating fun came in. It was really the first time either of them had done the door to door thing, and they both had a blast. Since moving here I've been disappointed at Halloween, because everyone here seems to take their kids up to the mall or something for trick or treating, no one roams the neighborhoods anymore. I got a pleasant surprise in this neighborhood...there were wee little beasties everywhere! It was like my own childhood memories - kids everywhere! 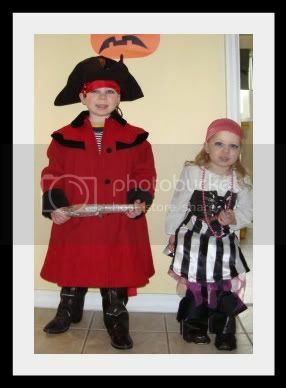 After the little ones were tucked safely in bed, mommy and daddy participated in some Halloween fun as well. We ate pizza, then a little too much of the kids' Halloween candy, and played Rock Band until late. It was nice to have some fun with our adult friends, it seems we get so little of that sometimes. And of course, we all got into the spirit too with some killer costumes. My favorite was seeing the normally casual Brenda dressed up in silk as Aphrodite, complete with elaborate flower tiara. 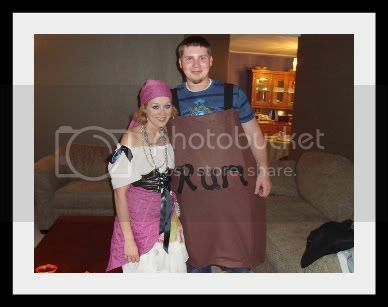 The original thought was for Evan and I to go together as a pirate captain and his wench, but then I saw an idea online and decided that what a wench needed more than a captain was a barrel of rum! Pictures will probably be more effective than words at this point. Please...I miss seeing your posts! !